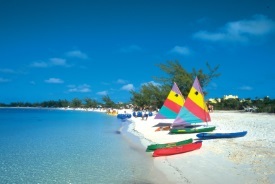 Half Moon Cay is a private island shared by Holland America and Carnival. The island is nine and a half miles around and has nine miles of beach (including an exquisite two-mile crescent-shaped beach), an exterior lagoon and an interior lagoon. The Bahamas National Trust has designated part of Half Moon Cay a wild bird preserve, leaving all but 55 of the island's 2,400 acres untouched and unspoiled and creating a plentiful habitat for a variety of land and seabirds. Spend the day horseback riding or hiking the island's nature trails through the lush broadleaf forest. Enjoy swimming, sunning and relaxing on the beach, or go scuba diving, snorkeling or kayaking. Deep-sea fishing, parasailing and glass-bottom boat rides are available. A variety of water toys are available for rent, including Hobie catamarans, Sunfish sailboats, windsurfing sailboards and kayaks.